From athletic achievement to corporate awards, this traditional metal cup is the ultimate in recognition. Stately and elegant, the cup is a highly polished gold finish with ornate handles and a distinctive scallop design around the cup. Mounted to a rosewood piano finish base with room to personalize, it's a beautiful piece that anyone would be proud to receive and display. From athletic achievement to corporate awards, this traditional metal cup is the ultimate in recognition. Stately and elegant, the cup is a highly polished gold finish with ornate handles and a distinctive weave design around the cup. Mounted to a rosewood piano finish base with room to personalize, it's a beautiful piece that anyone would be proud to receive and display. 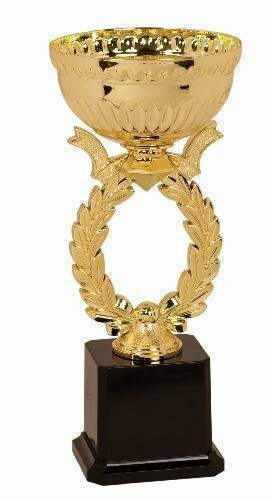 A striking cup trophy award at a budget friendly price point, this gold cup is embellished with black striped wings and is mounted on a black plastic weighted base with plenty of room to personalize. Customize the cup for your event using a 2" insert of your choice. Available in 4 sizes, this timeless award with a modern twist will cover your award needs.